Reuniting after 17 years, European fans will finally get a chance to witness Minerals’ live performance on their very first European tour. On the occasion of the bands’ first Parisian show last Thursday at Le Glazart (brought to us by Old Town Bicyclette and K&B), I’ve had the honor to sit down with frontman Chris Simpson for an interview. Being slightly nervous at first, he quickly reassured me with his wonderfully down-to-earth, friendly character, paving the way for a laid-back and interesting discussion about the band, the past as well as the future for Mineral. First off, how has the tour been going so far? Great! The US dates were all incredible, many of them sold out. We’ve been getting very energetic crowds, people singing along the words … it’s been a wonderful experience. We’ve had really good shows on this European tour as well, two shows in Italy and two in Germany before tonight. Starting from the very beginning, what is it that first made you pick up and instrument and start playing music? For me, I was very young. My mother was obsessed with music and played it all the time and I just knew early on that that’s what I wanted to do. So it took some piano lessons as a kid and got into drums for a while, I played drums in some bands in middle school. My brother had also gotten a guitar, so I was sneaking into his room when he was away and learning to play his guitar because he wouldn’t want me to touch it when he was around. So between piano and guitar I started writing music a bit more. I kind of always knew that that’s what I wanted; I was working towards it in various forms, up until Mineral even started. I’ve been playing in bands since middle school. At school and when you’re young and you play an instruments it’s easy to form bands, especially if you play drums, since more people play guitar it seems. Mineral was probably the first serious band that actually had records released and got to tour and whatnot. So this is your 2nd tour since your reunion after 17years back in April of last year. How did it feel to relearn these songs after all of these years? It was such a challenge; there was a lot of rehearsing involved. We rehearsed from February of last year to August before the first shows. We wrote these songs, we used to play them all the time, so you would think the memory of how to play them would be there, but in a lot of senses it’s not. So you really have to relearn it all from scratch. On some occasions I had to watch some live videos on youtube to see if I could get a hint of my hand positioning on the guitar when some particular parts of songs were eluding me. It was a challenge but it felt good to do. Once I relearned my guitar parts, I remember it all now and it feels like I’ve gotten back to the point where it feels natural. How does it feel to be back on stage as Mineral? It feels so nice. Before, we didn’t have rooms full of people who already knew the songs and wanted to hear them. This much easier for us than what we did originally. It’s nice to go out and play for a room full of people who already knew the material and who are there to see it. This is our first tour outside of the US, we never made it out of the states. I did a solo tour in Europe for my more recent stuff with Zookeeper in 2006 and I’ve been here a few times, just travelling, but this is my first time here with Mineral. 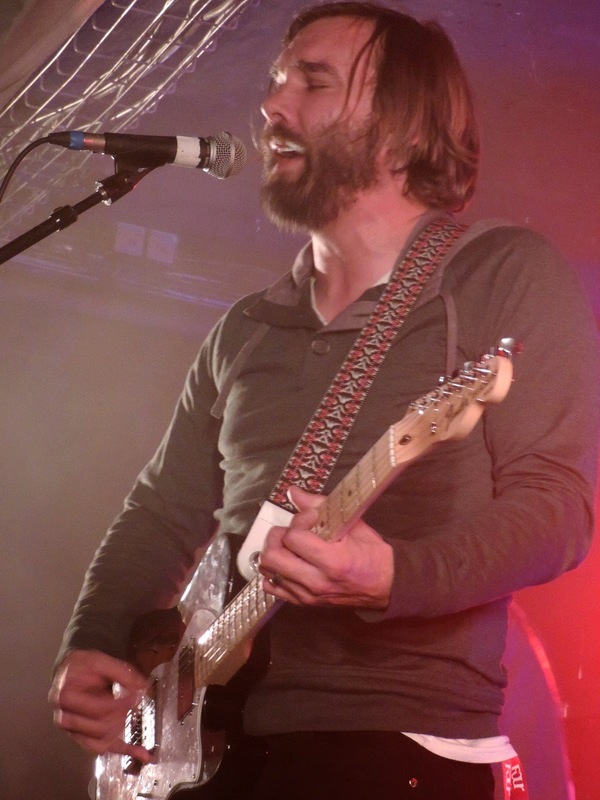 Do you feel like the music scene has changed since you first started out with Mineral? Well back then it just seemed to be all about networks of people who knew each other and talked on the phone. We were just starting to have email back then, but during the majority of the time we were a band there wasn’t really any of that. There were fanzines, people would make themselves photocopies and give them out at shows. It was kind of a more DIY culture, very small networks of people who knew each other back then. That also still exists but of course now we have also got the internet and social media. Nowadays it’s so easy to connect with people. Have the touring conditions evolved? Back in the day we played a lot of house shows, very small DIY parties, coffee shops and just anywhere they would let people put on shows. And now we play nicer venues with bigger sound systems where hopefully you can hear things a bit better. Do you still somehow miss playing some of these smaller venues now? I always like playing in small places, but also the reason Mineral can come back and play again is that there are these amounts of people who want to see us on tour. So I like to play somewhere big enough for everyone who wants to come see us. So do you see this tour and this reunion as more of an homage to those particular records or more of a continuation, a new chapter for the band? It feels like continuing. It doesn’t feel like nostalgia. It kind of feels like being transported back to that time and place, at least when we’re playing and connecting with the music. What kind of music do you like to listen to while on the road? I like to listen to a lot of Neil Young, Leonard Cohen and John Denver. I listen to a lot of singer-songwriters; it puts me in a specific mood, you know? What is the most rewarding part of playing music? Live shows for sure at this point, but also recording. I still love to record. Mineral is a great example of the idea that records are sort of immortal, you know? I actually don’t really remember recording the Mineral records too much actually. The band put out a couple of records and broke up like countless bands do every day, and now, years later, those records took up a life of their own, people can discover them. THAT is really neat. So I love records, but my favorite experience would still probably be playing live, getting to connect with people… There’s nothing that feels quite the same. Over the years, Mineral has become a household name in the emo genre. How does it feel to know that these records had such an impact and an influence on the newer generation of bands? It definitely wasn’t something we expected to happen when we were making Mineral records. It’s a wonderful thing. It’s always good to know that your music connects with people. Mineral felt kind of insulated at the time. We would often face our backs to the crowd. We weren’t really interested in the crowd of any sort.We were more interested in the experience we were having with this music. And now it’s nice to come back and get to see the people who appreciate our music and actually connect with them, you know? So it feels different in that sense now. It feels more like we’re here BECAUSE there are these people to connect with as opposed to us being here because we’re young guys who want to be in a band. What is next for Mineral? Are there any plans for a new album? There are no plans for a new album or anything beyond these tours, but we are starting to do some dates in the spring and summer, some festivals… Maybe we’ll be back in Europe. I don’t think we’ll do any more full tours unless there’s’ a reason to, like some new material or something. So I guess we’ll see what happens. It seems like new material would take some time to develop. So you’re not ruling out the possibility of writing new material. No one is closed minded to it, like “absolutely not!”, but we haven’t had any time or leisure to think about it or work on anything yet. So we’d have to see how it goes. It would have to be something that we’re all very passionate about. It’s a very interesting idea to me. I’m definitely curious about the possibility; to restart after all this time, being free to do whatever you want… then again you’re not really free, you know? The legacy of what you made 17 years ago would certainly have to color what comes next. A huge thank you goes to Chris Simpson, along with the guys from Old Town Bicyclette and K&B for making this interview possible.